They face blazing heat, fearsome predators, and food that fights back. But meerkats have secret weapons to help them survive: each other! These meerkats look pretty relaxed, don’t they? Warming up in the morning sun, they don’t seem to have a care in the world. But look closer: Their sharp little eyes are busy watching out in every direction. For meerkats, danger is always lurking nearby. An eagle could swoop in for a furry meal. A jackal could sneak up and pounce. Even another group of meerkats might be a threat. But meerkats have come up with a way to survive. They work together—all day, every day—to make sure the group stays safe. A meerkat is no mere cat. In fact, it’s not a cat at all. It’s a kind of mongoose. 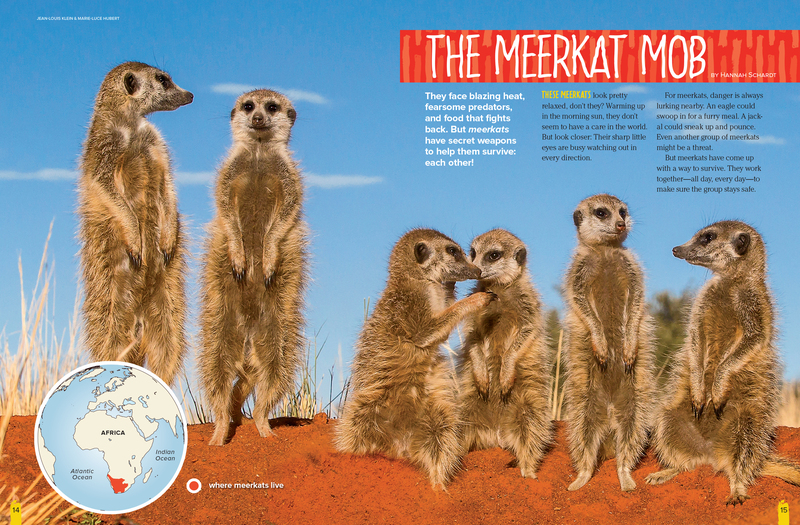 The meerkat is made for life in the hot, sandy deserts of southern Africa. Black markings around its eyes cut down on glare from the sun. An extra pair of eyelids act as “windshield wipers” to keep dust and sand out of its eyes. And long, sharp claws make digging deep, cool burrows easy as can be. It’s a good thing meerkats dig digging. Their burrows may have 15 or more entrance holes and go as deep as 6 feet underground! A meerkat group is called a mob. A mob usually has several members from the same family: Mom, Dad, pups, and the pups’ grown brothers and sisters. But the mob also includes unrelated adults that have left their own family groups. According to meerkat rules, only one female and one male are allowed to have pups. So sometimes an adult will leave the group to start a family of its own. In a meerkat mob, everyone has a job to do. Mob Job One: babysitter. When there are new pups to care for, Mom spends lots of time looking for food. Her body needs extra energy to make milk. So all the other adults pitch in to make sure the pups are safe and clean. Once the babies are old enough to eat solid food, the adults start their next mob job: teacher. Some favorite foods, such as scorpions, can give painful stings. So an adult will catch a scorpion, tear off the stinger, and bring it—still living—to the pups. This gives the pups a chance to practice killing prey—safely. Of course, scorpions aren’t meerkats’ only threats. That brings us to another important mob job: security guard. Whenever the group is outside the burrow, one member climbs to the top of a bush or another high spot to keep watch. If the guard spots a snake or other predator, it lets out a piercing alarm call. Usually, the mob will dash off to a bolt hole, a small dugout that offers safety when the home burrow is too far away. But sometimes, the group clusters tightly together and stands its ground. To a snake or other predator, the mob looks like one single, giant animal—too big to mess with! Each meerkat mob has its own territory. Members mark the territory’s borders with spritzes of smelly body fluid. But sometimes, one mob’s territory overlaps another’s. And once in a while, a land feud leads to all-out meerkat war! Like opposing armies, two mobs line up, tails held high. Then they rush at each other, baring teeth and claws. Some meerkats even die in these battles. 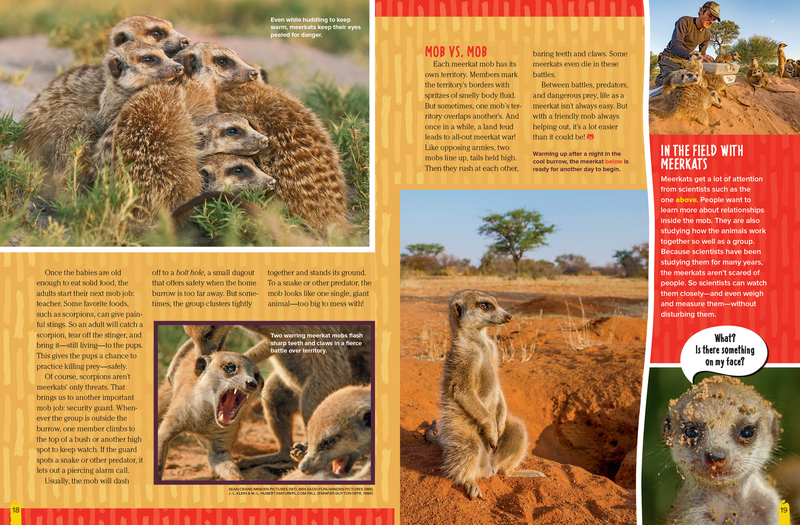 Between battles, predators, and dangerous prey, life as a meerkat isn’t always easy. But with a friendly mob always helping out, it’s a lot easier than it could be! Meerkats get a lot of attention from scientists such as the one above. People want to learn more about relationships inside the mob. They are also studying how the animals work together so well as a group. Because scientists have been studying them for many years, the meerkats aren’t scared of people. So scientists can watch them closely—and even weigh and measure them—without disturbing them. 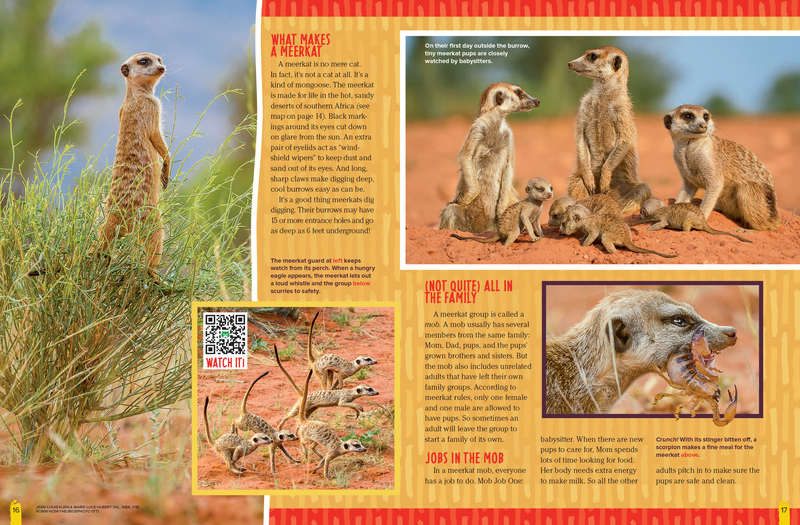 “The Meerkat Mob” originally appeared in the December/January 2018 issue of Ranger Rick magazine.